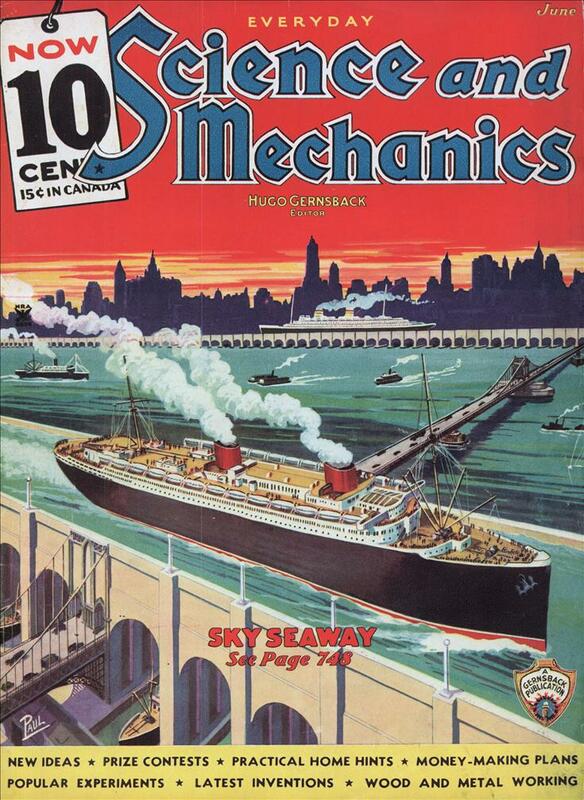 Jacques Gerin, French engineer, who invented the plane with variable wing: surfaces illustrated in our December, 1932, issue, has a new design for a 20-passenger ship in which the rear of the body flattens out into a spatula-shaped tail. With 3440 horsepower, he expects a speed of 310 miles an hour and a range of 2,500 miles. Landing: speed low— 25 miles an hour. From the people who brought you Airbus! Actually Airbus begann in Germany as “Deutsche Airbus GmbH”. But, granted, “Nord Aviation” and “Sud Aviation” (later to form “l’Aérospatiale”) joined later the same year. 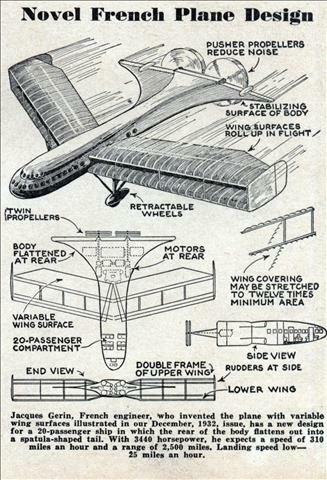 And indeed they brought the blueprint for the A300 as dower. It seems to be missing any kind of vertical stabilizer. As long as you didn’t actually try to fly the thing, it looks like it would work fine. The rudders are on the wing tips and they are swept. Assuming this design was airworthy. It’s awfuly large for only 20 people. M.S.W. : DC-3 could take 21 passengers at 1936. Jari: When I said large I mean as in large amount of raw material to contain the same human capacity of a plane like the DC-3. They are both roughly the same length but this one has double the material usage for the primary wings alone. As well as 1.5-2 times the material needed for the tail section.